The following post is brought to you by JustNeem – a North Carolina-based company, founded by a husband and wife duo, who were inspired by nature and ancient Indian roots to infuse science with medicinal secrets of the Neem tree. Grown on a sustainable Neem Tree orchard in Mauritania, the West African Neem has shown to have one of the highest concentrations of active natural compounds. The founders of JustNeem support natural resources in the Sahara Desert in pursuit of global environmental stability. They give back to the community in West Africa by planting trees, offering well-paying jobs, and supporting families and teaching new skills in one of the poorest areas of the world. I have struggled with acne since my teenage years. Now as an adult, the acne has subdued with a pimple here and there, but I still struggle with pimples on my neck and shoulders. So, I’ve been on the search to find a product that would tackle my adult acne without the added chemicals, and if you’ve ever had acne you know it can be hard to find products that work without drying out your skin too much, making it feel parched and like sandpaper, and not to mention looking dry and dull. 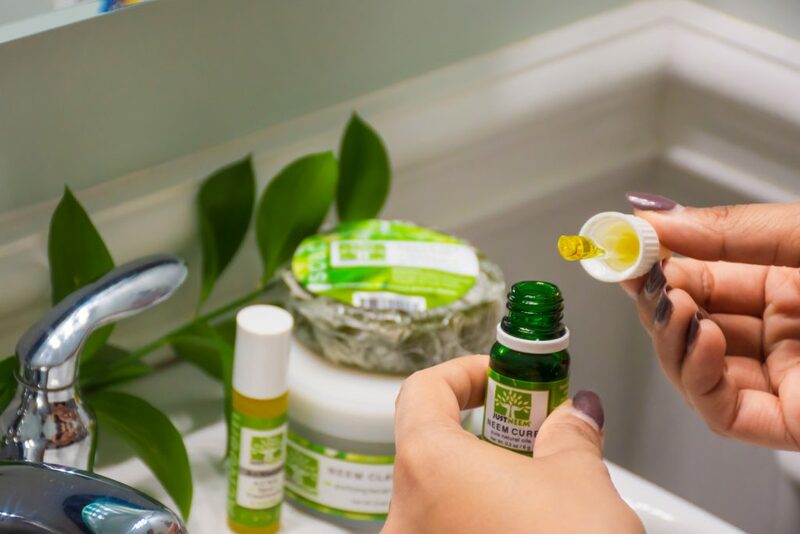 So, when I started using the JustNeem product line, I realized it deep cleans and does a good job on my breakouts without being overly abrasive and leaving your skin feeling dry and too tight (ugh because who wants to feel that way!?). For all the brown folks reading this, y’all know neem dates back before our parents and grandparents age, and it was always an integral part of their skincare. 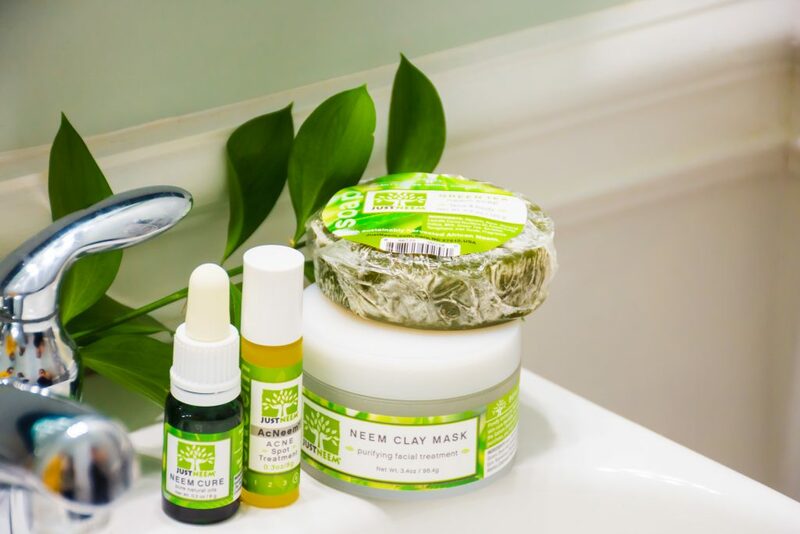 Granted we may have not believed them when they told us to start using neem in our skincare routines but JustNeem makes it easy and accessible to include in my everyday life. There is a reason Neem has been used for centuries! My new friends at Just Neem sent me four products—Green Tea Neem Soap, Neem Clay Facial Mask, Neem Cure Oil, the AcNeem Acne Spot Treatment —to try and I used them regularly for a while before sharing my thoughts with the #browngirlmag fam. For starters, I love the Green Tea Neem Soap for the face and body to tackle the random eruptions on my face, shoulders, and neck. Did I mention it smells ah-mazing?! The soap lathers up nicely and really gives a deep clean without stripping the skin of its natural oils. Also, the soap has particles from the neem tree so it acts as a gentle exfoliant while cleansing. Some acne soaps are so harsh that applying a moisturizer, toner or serum afterwards actually burns or stings the skin. But with this soap, that definitely wasn’t the case. The Neem Clay Facial Mask is cooling and detoxifying. It also has bits of Neem leaves in the mask for extra exfoliation. With other clay masks, your skin becomes extremely tight with dryness, that makes smiling and showing expressions a game of tug-o-war. 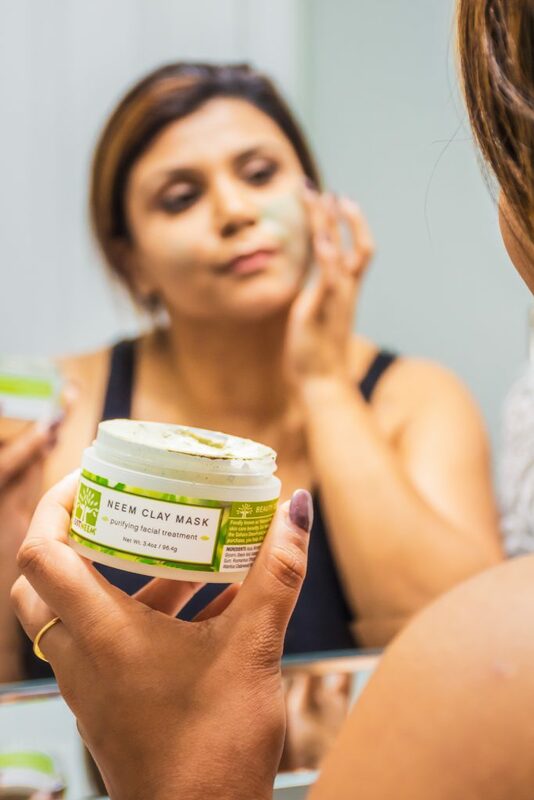 After using the Neem Clay Mask, my skin was tight but it had still retained moisture in the skin. It didn’t feel parched or flaky, there were no signs of dryness around my mouth (my one spot I see dryness the most), yet my skin looked bright and smooth. As for the Neem Cure Oil, which is a blend of Neem oil and other essential oils, is great for all skin types but helps kill bacteria that cause my breakouts. It also adds antioxidants and vitamin E. I use a few drops before my normal nightly moisturizer. The neem oil gives my skin the glow I need to conquer the world (literally!) and penetrates quickly to improve the skin from underneath. It’s not greasy or too thick so it doesn’t sit on top of the skin. Because of the thin consistency, I’m not afraid to layer or add a heavier cream if I want more moisture. On the other hand, the AcNeem spot treatment is effective yet not overly drying. I don’t have flaky white skin around the affected area(s), rather the spot treatment helps to form a white head for a faster recovery. The AcNeem (acne spot treatment) works really well on its own but is extra beneficial when mixed with the Neem Cure Oil. My trick is to use them at night so that I reap the full benefits while my skin is resting and repairing (the epitome of beauty sleep, no lie). Both work really well together to add moisture back into the skin, while actively working to dry out pimples. Having skin issues is common for us all. Whether it’s acne, dry patchy skin, or the occasional breakout. Our skin is what we present to the world and we don’t want to be on an emotional roller coaster ride over how it looks. Now I have something that’s natural and does the trick. JustNeem has seamlessly bridged the gap of age-old Indian rituals to our modern day skincare routines. So in the words of our elders and in agreement with everything they say — ‘old is definitely gold’ (or aka our parents are always right! ).